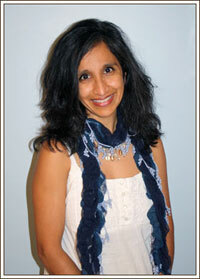 Home >> Our Providers >> Sharmila Jones, M.D. Dr. Sharmila grew up in Parkersburg, WV where her parents still reside. She received an undergraduate degree in economics and political science from Boston University and her medical degree from the Marshall University School of Medicine. Her residency training was completed at the Columbus Children's Hospital/Ohio State University; Dr. Jones is board certified in pediatrics and is a fellow in the American Academy of Pediatrics. Her special interests include breastfeeding, preventative medicine and international adoption. At home, she takes care of her four sweet children and husband Dr. Eric. In her spare time, Dr. Sharmila enjoys painting, playing tennis, reading and taking walks with her family.